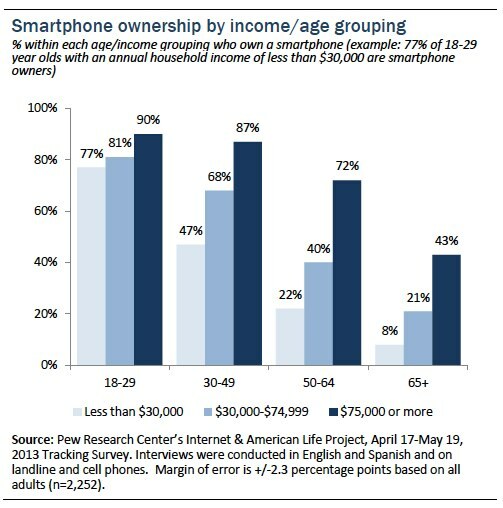 Younger adults—regardless of income level—are very likely to be smartphone owners. Conversely, for older adults smartphone ownership is more of an “elite” phenomenon: smartphones tend to be quite prevalent at the upper end of the income distribution but much less common among those with lower income levels. Senior Health Weekly also comments on the importance of keeping seniors connected with others and how Smartphones offer an antidote to loneliness, which is often common as people age. While a lot of Smartphone apps are designed with a younger audience in mind, there are some apps that are perfect for seniors. Facetime or Skype: An obvious choice, Skype lets users easily connect with friends and family over long distances with an easy-to-use interface. A Story Before Bed: This great app lets grandparents record audio and video of themselves reading children’s classics from the apps library, then send it to their grandchildren, who then can read along to the story images while also watching the image of their grandparent reading the story in a corner of the screen. At $9.99 a month it’s pricey as far as apps go, but it undoubtedly provides a unique form of inter-generational long distance communication. Dragon Dictation: Dragon Dictation helps users send emails, texts and surf the web through accurate voice dictation and a user-friendly interface. Pill Reminder by Drugs.com: Sends reminders for to take medications and refill prescriptions, and can be set up for multiple user operation so family members and others can help administer care. Blood Pressure Monitor: Helps users track vital health information; includes an email import/export features that helps users communicate data with healthcare providers. Crosswords: There are lots and lots of great games and lifelong learning apps out there for seniors, but what better place to start than the timeless classic of crossword puzzles? This $9.99 app has all the fun of newspaper crossword puzzles with the enhanced usability inherent in devices. It’s also legit: No less a definitive crossword authority than The New York Times has given it rave reviews. Lumosity: This brain game quiz app game is meant to be fun while also providing an energetic workout for the mind that is designed to enhance memory and cognitive speed. Find my iPhone: Sometimes we lose things, regardless of our age. This great app lets users find lost iOS devices — which hopefully are no further away than the couch cushion. If they are truly lost, the app lets you lock them remotely. Silver Surf: This free web browsing app features large navigation buttons, text zoom and high-contrast page viewing. Voice Reading: This app can read aloud texts, files and content from web pages for users with impaired eyesight. This entry was posted in Audiology Trends, Consumer Marketing and tagged Seniors, Smartphones. Bookmark the permalink. 1 Response to Do Seniors Use Smartphones? This is really very nice post . great!